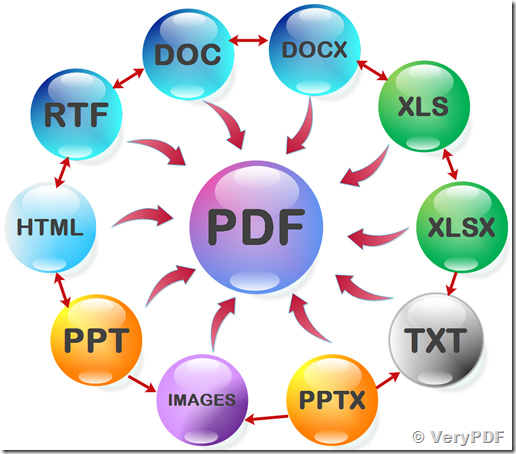 ← Is there an API for converting PDF to Image and image to PDF? VeryPDF is always working on Document Conversion technologies, we have ability to do following conversion on various platforms, include Windows, Mac, Linux, iOS, Android, Windows Phone, etc., without MS Office and OpenOffice installed. Convert Word (.doc, .docx) to RTF, HTML, PDF without MS Office and OpenOffice installed. 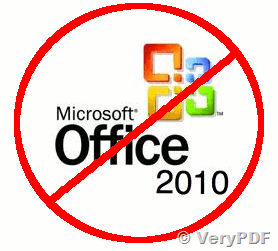 Convert PowerPoint (.ppt, .pptx) to HTML, PDF without MS Office and OpenOffice installed. Convert Excel (.xls, .xlsx) to CSV, HTML, PDF without MS Office and OpenOffice installed. Convert OpenOffice (.odt, .ott) to RTF, HTML, PDF without MS Office and OpenOffice installed. Convert HTML to PDF without MS Office and OpenOffice installed. Convert Image formats (TIFF, PNG, JPG, BMP, GIF, PCX, TGA, PSD, etc.) to PDF file. VeryDOC DOC to Any Converter is a Windows Command Line application, it can convert DOC, DOCX, PPT, PPTX, XLS, XLSX, HTML to PDF and SWF files, with or without MS Office and OpenOffice installed, this will solve your concern about the MS Office License Issue completely, save your money from purchase one or more MS Office licenses. We can provide Command Line application or DLL Library or COM Component or ActiveX or Cloud API for these format conversions. This will allow you to convert office documents to PDF and other formats on all popular platforms, include Windows, Mac, Linux, iOS, Android, Windows Phone, etc. If you have any question or encounter any problem during parse these document formats, please feel free to let us know, we are glad to provide assistance asap. This entry was posted in Office to Any Converter and tagged doc to pdf, docx to pdf, Office to PDF, OpenOffice to PDF, PPT to PDF, pptx to pdf, rtf to pdf, word to pdf, xls to pdf, xlsx to pdf. Bookmark the permalink.